Two persons from China have impressed me very much in the recent months. First, a little cute girl who can be seen here playing “Souvenir D’enfance” by Richard Clayderman on the piano for a television show. In this video, she plays the entire song beautifully, despite a significant disadvantage, as her right hand is missing all of its fingers. Comments have been pouring in after I posted this video on youtube. “So beautiful and﻿ talented. It demonstrates that you can become what you wish against all odds,” a visitor posted. Sure, where there is a will, there is a way. Believe you will watch and share the guts and determination of 19-year-old Zheng Guigui who comes from a small town in China’s Henan Province. Perhaps this being in his mind, he attempted to launch a magazine – Party — for alternative thinkers. But, his great initiative which sold 1.5 mn copies collapsed after just one issue. He had to fold his publication and disband his editorial team. All this happened in 2010. “Thanks to all the readers, thanks to all editors and staff. Our regret is that as a literary magazine which should have been given plenty of time for preparation, the first issue was not good enough, but unfortunately everyone has seen it. We have made sufficient improvements in the second issue, but unfortunately no one can see it now,” Han Han posted. I am given to understand that he dumped the magazine as 70 per cent of the original content was scrapped to secure approval for the publication of his first edition. Thus, I would call his decision bold. Why succumb to the people whose graves you must dig. Han Han wanted to provide a good art publication with more free and wild writing from musicians, film directors and offbeat writers, but his idea seemed too good to be true. 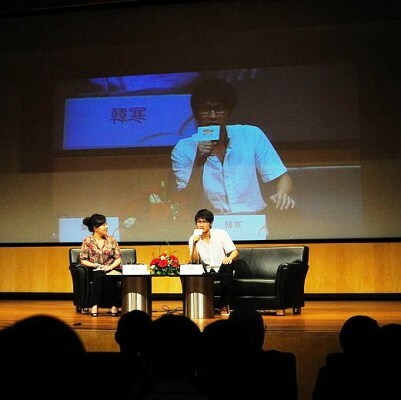 His blog, which attracts millions of visitors… may be… scared the Chinese authorities. Were they nervous of Han Han? Did they fear that he’d begin putting contents therein from his controversial novel – 1988: I Want to Talk with the World? I look to Han Han as the voice of the Chinese people. He has a cause. And I have been taught that the purpose of a writer is to keep civilization from destroying itself. 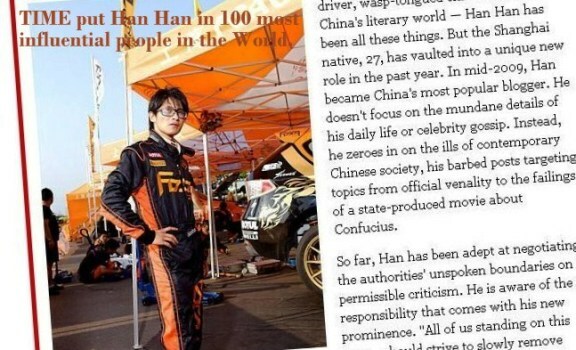 I want people like Han Han to rise both in East and West. I want them to be beyond anybody’s control. I look to Han Han as the voice of the Chinese people. He has a cause. And I have been taught that the purpose of a writer is to keep civilization from destroying itself. I want people like Han Han to rise both in East and West. I want them to be beyond anybody’s control….by NEERAJ BHUSHAN.